Leaving Bryce. Stopping for peanut butter and wood. Endless landscapes. Unpaved road to the trailhead. Wire Pass Trail. Friendly Germans. Sandwich before starting. Sun block. 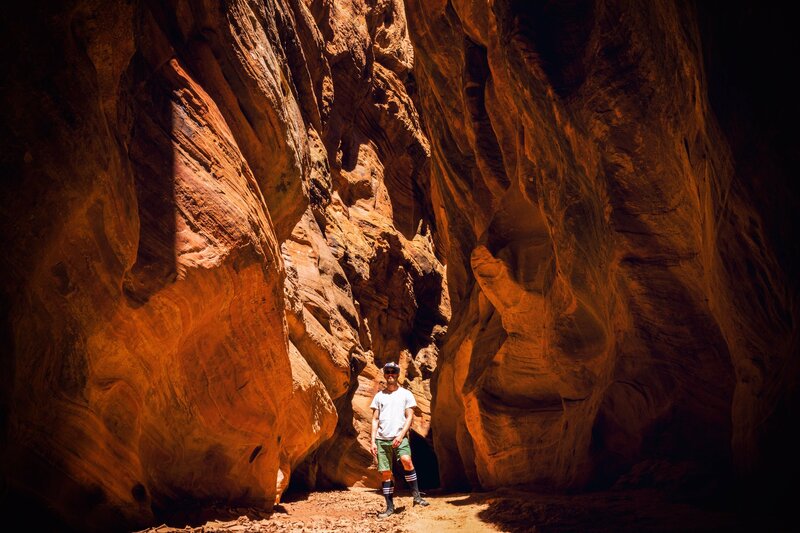 Slot canyon hiking. Navigating a boulder. Paths split. Trying each end. Another break. Selfies. Heading back. Why did the rattlesnake cross the road? Bumpy exit. On the highway. To Kanab. Gas. Miscalculated camping. Looking familiar. Back in the same spot a few years ago. Quick drive to Horseshoe Bend. Too many Asians. Too many people. Scary overlook. Back at the campsite. Cool pool. Spinning around. Water karaoke. Showers. Dinner. Forgotten coals. Woman who does nothing.